Merrill Shatzman’s combined silkscreen and woodblock prints, woodcut constructions and artist books evoke the rich history of calligraphy and letterforms. In the brilliant series Alphabetic Excursions Illuminated Manuscripts (2011) Shatzman reinterprets letterforms utilizing woodcut and digital processes and transcribes them into abstract “glyphs” which compose the multiple rich surface planes of each work. The development of these forms from hand cut blocks to digitally redrawn glyphs may be seen in the large digital print 18 Hours, 1420 Miles, 500 Tiles (2011). Shatzman’s personal alphabets no only reference the history of art but also contemporary writing practices such as “wild style” graffiti as is Graffiti Glyphs (2011) in which fibers in the rice paper of one layer in the construction have been meticulously cut out to create exuberant wayward strands. The layering processes that have led Shatzman to expand the picture plane fine a new outlet in the series of Cryptic Writing books that the artist is exhibiting for the first time, in strata of pages and intricate hand cut openwork letterforms, are combine in three-dimensions. As a printmaker, I am experienced in all areas of print media, with my work focusing on a specific approach in the development of a body of work. Technical prowess and craftsmanship are crucial in creating my images. 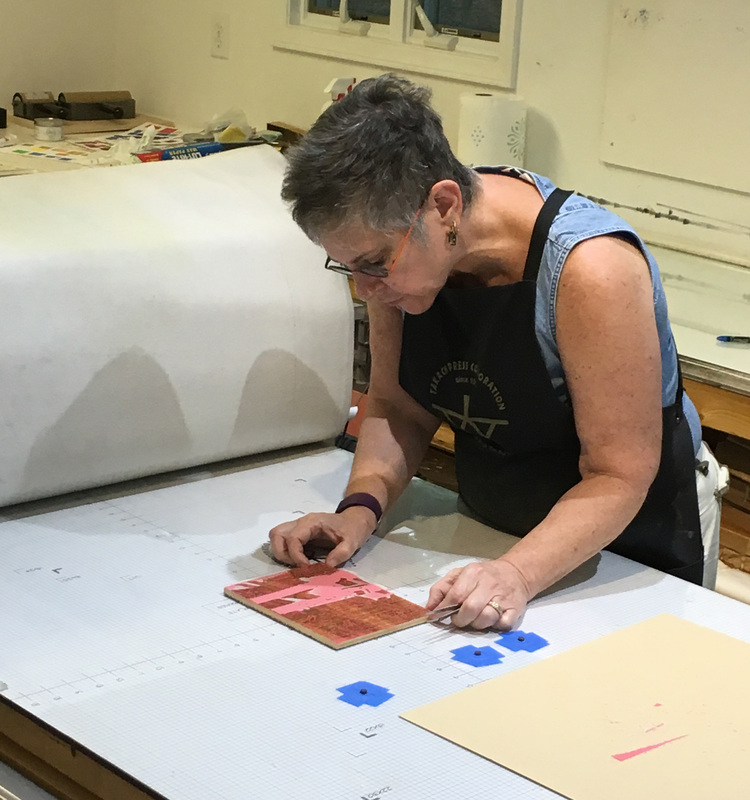 In addition to using traditional mark-making methods, I use technology as part of my working process, employing digital imaging and laser fabrication in aspects of my printmaking practice. My prints are conceptually developed in a serial/sequential format, where visual elements are continually repeated, repositioned and reconfigured in different arrangements and contexts. I continually rework and layer my images, moving forms into various matrices to indicate time and movement, then printing them in different orders and combinations, resulting in an array of different outcomes. Marks, forms and information are carefully revealed through this layering process, with the resulting translation and transition of words into images and images into words playing a crucial role, as the viewer, through imaginative interpretation, decodes what is presented. I continue to discover new, randomly established visual combinations that provide new directions for my work from this working process. I no longer make editions of my prints, instead creating unique images. Additionally, by excising and layering sections of my images, I combine several prints together, with my “constructed prints” offering physical depth to my initially flat works. My fascination and use of mapping becomes evident in these dimensional prints, for through the arrangement of different layers and glyphs, topographic patterns become an important motif. This method of working has served as an excellent segue to making more sophisticated low relief imagery using laser fabrication.